North Island of New Zealand and two counties in California. There is also one location in GBIF from Chile. Present in two counties in California. Seasonal wetland, sandy soils, drainage areas, disturbed areas. Network, N. Zealand Pl (2015). New Zealand Plant Conservation Network. 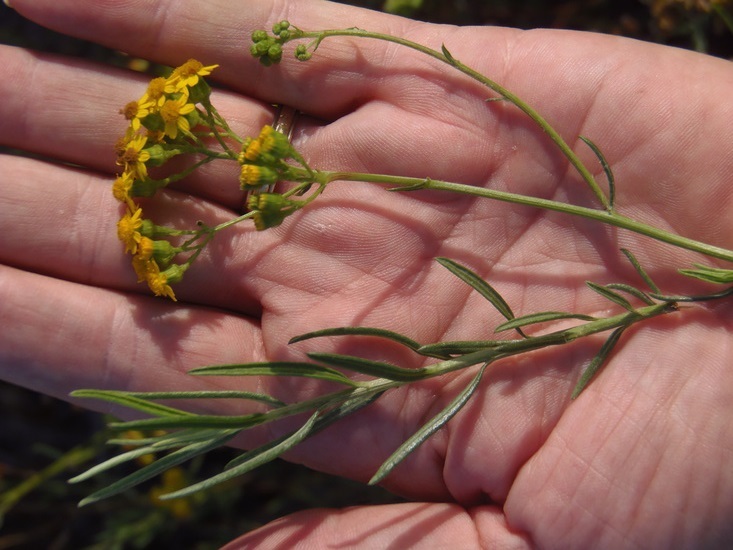 Senecio jacobaea (tansy ragwort) is invasive in California (Limited rating on Cal-IPC Inventory) because it can crowd out desirable forage species and displace native plants in disturbed areas. Cape-ivy (Delairea odorata, formerly Senecio mikanioides) is a highly invasive plant in California (High on Cal-IPC Inventory) because it creates dense infestations in coastal areas. Seems unlikely for a woody subshrub. Flowers May - October in California. There is no evidence on dispersal of S. linearifolius by mammals or birds. Dispersal by wind is most likely since the fruit has a pappus. Note from Ron Vanderhoff: I do not have a reference study to support this, but it would be strongly assumed that this species would be wind dispersed, and likely at long distances. The architecture of the seed, like almost all Senecios, is built for wind transport. It has long pappus bristles of 5-8 mm and a very light seed. Virtually all species of the genus Senecio share an airborne seed dispersal quality. There is no evidence for dispersal by contaminated seed, equipment, vehicles or clothing. Cannot find information on even basic biology of this species. A literature search brought up only four articles. Australian plant websites had only maps. The plants in California are S. linearifolius var. linearifolius. Reviewed and observations added by Ron Vanderhoff, Orange County CNPS. Also reviewed by Mona Robison.